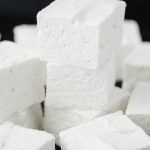 Legit Keto Marshmallows are here! If you’ve been disappointed by sugar free marshmallows in the past. you’ve got to try this recipe! Are you ready for the best, most delicious, truly legit keto marshmallows?! Several months ago, I started using allulose in my bean to bar chocolate making. What’s allulose? It’s a naturally occurring non-caloric sweetener called a rare sugar. And since it’s hardly fermented in the gut, it may be a good choice for those that experience digestive upset from erythritol. While I LOVE using Swerve in many baked goods, erythritol recrystallizes very easily. That means it’s often not ideal for candy making or caramel. As a former pro pastry chef, it gives me flashbacks to the misery of accidentally recrystallizing a giant pot of sugar syrup which was meant to become caramel sauce! Some people also experience an aftertaste and cooling sensation with erythritol. 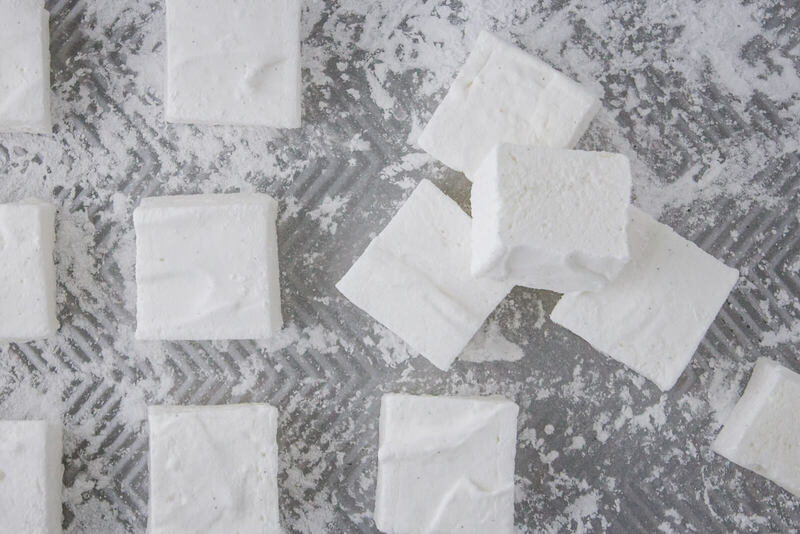 That aftertaste is pretty easily covered up in cookies and cakes, but homemade marshmallows rely completely on the sweetener and vanilla for their flavor. Between the issues with texture and flavor, I have never been happy with low carb marshmallow recipes that include any amount of erythritol. That’s where allulose comes in! Allulose tastes more like real sugar than any other non-caloric natural sweetener. You CANNOT use the same ratio of allulose : water : gelatin that you would use if you were using sugar. Don’t even bother trying. If you do, you will get a lovely and delicious marshmallow fluff, but it will never, ever set up as a marshmallow should. However, if you use the recipe in this post, you can make firm, pillowy keto marshmallows that truly taste and feel like the real thing. By using only allulose, the sweet vanilla flavor sings, and the texture is smooth perfection. What’s The Best Brand Of Allulose To Use? I use Hoosier Hill Farm allulose that I purchase through Amazon. I’m sure there are others that are fantastic, but Hoosier Hill is the one I have worked with and tested the most. You can click here to purchase the same allulose I use. Is there a lot of sugar in marshmallows? 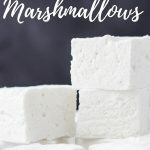 Are marshmallows keto friendly? I wish! Store-bought marshmallows such as Kraft Jet-Puffed, and even Elyon Natural Marshmallows have a whopping 24 grams of carbs and 17 grams of sugar per serving. As a Type 1 Diabetic, that would send my blood sugar through the roof! Is there such a thing as sugar free marshmallows? Yes! 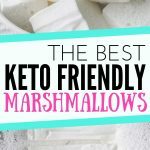 Unfortunately, as of the writing of this post, the only commercially available, truly keto friendly marshmallows I know of have been discontinued. 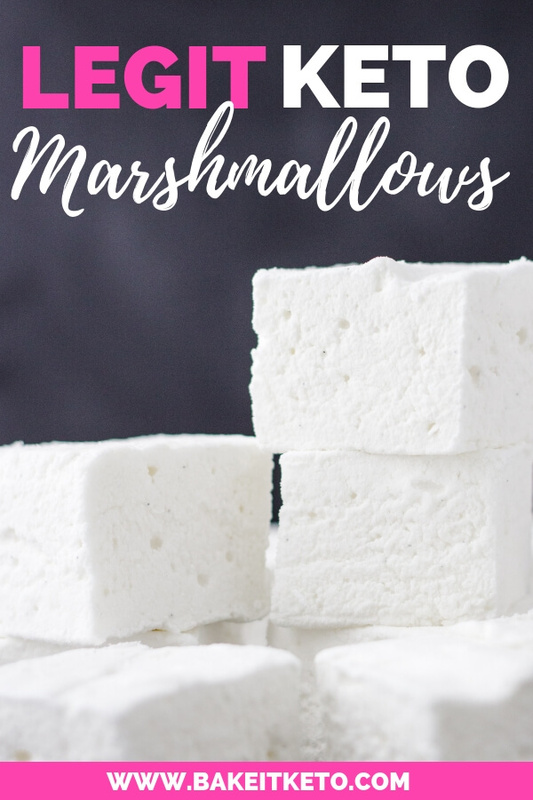 But with a very small amount of active time in the kitchen you can make your very own delicious, sugar free and keto marshmallows using this recipe. 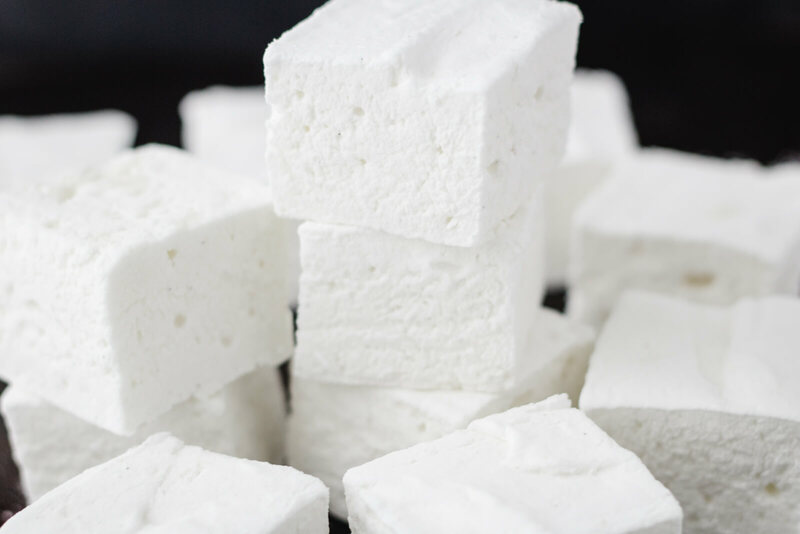 Xylitol is often recommended in recipes for sugar-free and keto marshmallows, but it doesn’t actually have a glycemic value of zero. In my experience as a Type 1 Diabetic, I’ve found that it spikes my blood sugar quite a bit so I avoid it. Since Xylitol is also deadly to dogs, we choose not to keep any in our kitchen. Let’s be honest, who else is really here looking for keto s’mores? Just me? These sugar-free marshmallows can be used for smores, but they definitely won’t toast in the same way a Kraft Jet-Puffed marshmallow will. You’ll get the best results if you allow them to dry out as much as possible (at least overnight) and stick to short bursts of high heat. While allulose carmelizes very well (even better than sucrose! ), the marshmallows will disintegrate when you hold them in the heat for too long. Lightly grease two 8x8 square baking pans OR one 9x13 baking pan with pan spray and line the pans with a strip of parchment. I recommend spraying the pans once more to grease the parchment. Add 1/2 cup water to the bowl of a stand mixer fitted with the whisk attachment. Sprinkle the gelatin over the water and immediately stir to moisten any dry gelatin if necessary. Set the gelatin mixture aside to bloom while you make the allulose syrup. In a medium heavy-bottomed saucepan, cook the allulose and the remaining 3/4 cup water, undisturbed, to 240 degrees F on a candy thermometer (soft ball stage). Pro tip: Keep a pastry brush in a cup of water next to the stove and periodically use it to wash down any crystallization that forms on the sides of the pan while the syrup cooks. Once the allulose syrup reaches 240 degrees F, carefully add the hot syrup to the gelatin mixture in the bowl of the stand mixer. Start the mixer on low and run it while you add the vanilla and salt. Turn the mixer speed up to medium and whip until the marshmallow begins to thicken and lighten in color. At this point, you can turn the mixer up to high speed without the liquid making a giant mess. Whip on high for at least 10 minutes. You will know it's done when the marshmallow is VERY thick, glossy, cool to the touch, and holds firm peaks. Working quickly, use a rubber spatula to scrape the marshmallow into the prepared pans. Use an offset spatula to smooth the surface as much as possible (you can oil both spatulas to help prevent sticking if you want to). Allow the marshmallows to set for at least four hours or overnight. Using a blender, grind the additional allulose for dusting until it's the consistency of confectioners sugar. I use 1/4 cup of allulose and grind it in my Nutribullet. 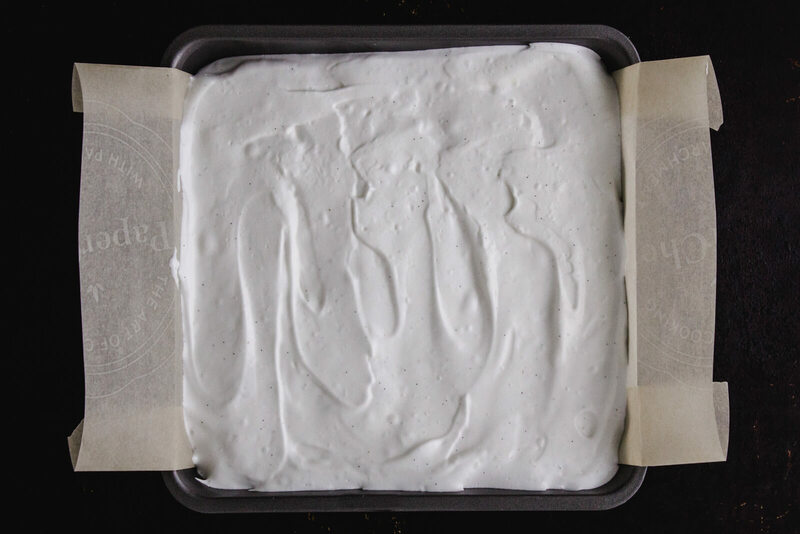 Use the parchment paper to lift the marshmallow out of the pans. Using an oiled knife, trim the edges and then slice the marshmallows into strips. 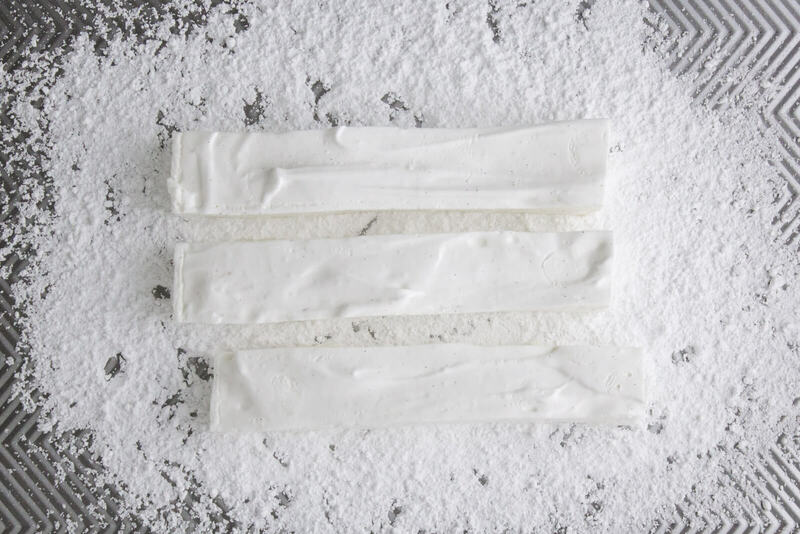 Dust the surfaces of each marshmallow strip with the powdered allulose. Then slice the marshmallow strips into squares and dust the cut sides. I find that I don't need to oil the knife when I cut the strips into squares. Store the marshmallows in an airtight container. Or, lightly cover the container with a paper towel and allow them to dry out overnight, undisturbed. WANT TO SAVE LEGIT KETO MARSHMALLOWS FOR LATER? CLICK HERE TO SAVE THIS RECIPE TO YOUR FAVORITE KETO PINTEREST BOARD! « How To Make Cauliflower Rice Taste Good!